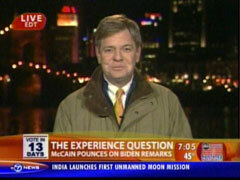 Liberal reporter David Wright took a swipe at Sarah Palin on Wednesday's edition of "Good Morning America." Discussing Senator Joe Biden's comments over the weekend that Barack Obama will face an international incident within the first six months of his (potential) presidency, the ABC journalist editorialized, "Her own glass house notwithstanding, Sarah Palin has thrown some stones on the issue, too, even though she's not above making gaffes of her own." He then introduced a clip of Palin speaking to a Denver NBC affiliate and asserted that the Republican vice presidential nominee "didn't seem to understand the job description of the position she's running for." Palin was featured observing that the vice president is "in charge of the United States Senate. So, if they want to, they can really get in there with the senators and make a lot of good policy changes." Taking issue with Palin's comments, Wright retorted, "Technically, the vice president does preside over the Senate. But the most they usually contribute is a tie breaking vote when required." Wright didn't mention it, but the question was actually part of the local affiliate's "questions from the third grade" series, where politicians answer questions from local children. (Palin prefaced her answer by noting, "Oh, that's something that Piper would ask me.") Considering the generalized tone of the Alaska governor's statement, it seems clear she was tailoring her remarks for younger people. Wright should have mentioned the context. During the 2008 campaign, David Wright has turned into one of the more aggressive advocates for Barack Obama. On the October 10 edition of "Nightline," he accused the McCain campaign of conducting a "fear and loathing strategy." For a October 9 GMA segment, he railed against the "full-bore attack on Obama's character" and complained that McCain and Palin have suggested the Democrat is "yellow, disloyal and doesn't belong." On Wednesday, he did highlight Biden's gaffe about Obama and an international incident, but he derided Republican attacks on the subject as playing into GOP "talking points." ROBIN ROBERTS: But we begin with the very latest in the election. Just 13 days to go and ABC's daily tracking poll finds Senator Obama still holding a nine-point lead over Senator McCain. The McCain campaign is trying to cut that lead by challenging Obama's experience, continuing to capitalize on comments made by Obama's running mate. Our David Wright has the latest and he's in Ohio this morning. Good morning, David. DAVID WRIGHT: Good morning, Robin. For two days now, the Republicans have treated Biden's comments like a, like a slow pitch across home plate. Calling it one of the best cases yet made yet against Barack Obama. Saying it's an admission of his inexperience and more than that, an admission that his inexperience would tempt America's enemies to test us. Biden made the comment Sunday night at a fund-raiser in Seattle. SENATOR JOE BIDEN: Mark my words. It will not be six months before the world tests Barack Obama like they did John Kennedy. WRIGHT: He was apparently referring to the Cuban missile crisis, which may well be the closest America ever came to nuclear war. In other words, he was predicting no small test. BIDEN: Watch. We're going to have an international crisis, a generated crisis, to test the mettle of this guy. And he's going to need help. SENATOR JOHN MCCAIN: I've already been tested, many times. WRIGHT: The McCain campaign pounced. MCCAIN: I sat in the cockpit on the flight deck of the "USS Enterprise," off of Cuba. I've been tested, my friends. WRIGHT: Biden's statement played right into their talking points. That their guy has battle scars. And the other guy is a dangerous rookie. This mailer being sent out in Virginia and Missouri lays out in the strongest terms, evoking the imagery of airplanes. The caption reads, "Barack Obama thinks terrorists just need a good talking to." MCCAIN: We don't want a president who invites testing from the world at a time when our economy is in crisis and Americans are already fighting in two wars. PALIN: I guess we got to say, well, thanks for the warning, Joe. WRIGHT: Her own glass house notwithstanding, Sarah Palin has thrown some stones on the issue, too, even though she's not above making gaffes of her own. Speaking yesterday to the Denver NBC station, she didn't seem to understand the job description of the position she's running for. UNIDENTIFIED VOICE: So, now, what does the vice president do? PALIN: Oh, that's something that Piper would ask me. They're in charge of the United States Senate. So, if they want to, they can really get in there with the senators and make a lot of good policy changes. WRIGHT: Technically, the vice president does preside over the Senate. But the most they usually contribute is a tie breaking vote when required. And in the meantime, there is this controversy about Palin's wardrobe. Politico.com, reporting that outfitting her has cost a couple of $50,000 shopping sprees at Saks Fifth Avenue, a $75,000 shopping spree at Neiman Marcus for her and her family. Now, the Republicans say they don't comment on strategic decisions about the money that they spend. They say, with all the other big issues out there, they're surprised we're talking about blouses and pantsuits. But, Robin, they do say that after the campaign's over, they'll donate the clothes to charity.